In a skillet, heat up the olive oil and butter. Add the chopped onion and saute for about 1 minute. Add the chopped mushrooms, thyme, rosemary and salt & pepper. Cook until the onions and mushrooms are tender and there is no moisture left from the mushrooms. Stir in the Chardonnay and cream. Remove from the heat, and stir in the Gruyere cheese. Set aside. On your counter, lay out the puff pastry with the parchment paper it came with still attached. Using a pizza cutter cutter, cut the pastry into 16 pieces. Scoop about 1 tbsp of the mushroom mixture into the centre of the dough (do not overfill or they will leak). Then fold the dough in half and press the edges to seal them. 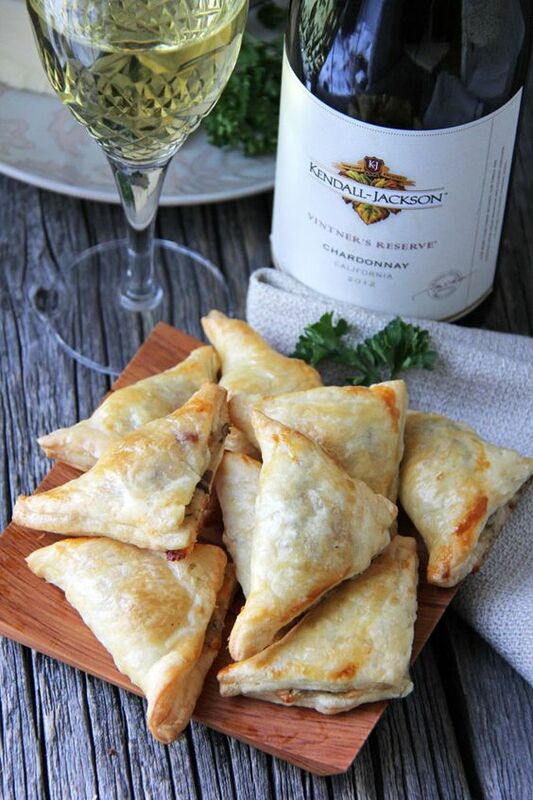 Place the mini turnovers onto your prepared baking sheet, at least 1 inch apart. Brush the sealed edges and tops of the turnovers with the egg mixture. Repeat the above with the other puff pastry sheet and remaining mushroom mixture.